Central Japan is a region of tall mountain ranges and fast-flowing rivers. It wasn’t until recently that roads reached the remoter villages, and today many remain remarkably well-preserved and evocative of centuries past. Your journey takes you through Japanese history from modern Tokyo, known as Edo during Japan’s period of rule by the Shoguns, to end near Kyoto, Japan’s capital for 400 years and the repository of much of the country's cultural heritage. From Tokyo you head first to Yudanaka Onsen hot spring where the famous “snow monkeys” come to enjoy the natural hot spring baths just like humans. In feudal times people travelling from Kyoto to Tokyo would use the Nakasendo way – the road through the central mountains – one of a network of ancient highways. You will visit one of the best-preserved sections in the Kiso Valley, where the lovely villages of Tsumago and Magome have been immaculately restored. Please ask for information about tour extensions to the art island of Naoshima, the UNESCO World Heritage of Miyajima Island, and Tomonoura Bay on the Setouchi inland sea or the peaceful, agricultural community of Asuka at a charming Japanese inn or with a local family for a unique homestay experience. Your Oku Japan tour begins with your arrival at your hotel in Tokyo. On our Standard tour, accommodation options include the Hotel Niwa and the Shiba Park Hotel – modern, western-style hotels with private en-suite facilities. Daily breakfast is included with both options. Transfers are not included, but whether you are flying into Narita Airport or Haneda Airport, or arriving by train from elsewhere in Japan, we will happily advise you on the best way to reach your accommodation. Arm yourself with your favourite guidebook and begin your discovery of the modern capital of Japan. You will have a full day in Tokyo to explore this vibrant city. Visit the glittering Ginza area with elegant department stores and food halls crammed with all kinds of unfamiliar delicacies. Or spend time among the skyscrapers of Shinjuku and pass through Shinjuku station, the busiest transport hub in the world. Eat and drink in one of the myriad small bars and restaurants which cluster around most railway stations, or splash out on an elegant meal in an upscale restaurant. Today you will travel to Yudanaka Onsen, a hot-spring village famous for its ‘snow monkeys’. The Japanese macaques originally came here to warm themselves in the outdoor hot-spring bath during the cold winters, and now come all year round. Today you will travel first to the city of Matsumoto to see its beautiful castle, built in the 16th century. After lunch you continue to the Kiso valley and the small town of Narai, an atmospheric example of a post-town on the ancient Nakasendo Trail between Kyoto and Tokyo. There are many well-preserved houses and former inns. Our choices of accommodations includes an Edo-period house converted into a minshuku. After breakfast, there will be time to wander the beautiful streets of Narai. The village is a good place to buy lacquerware and woodcrafts, made from Japanese ‘hinoki’ (which resembles cypress) and zelkova. 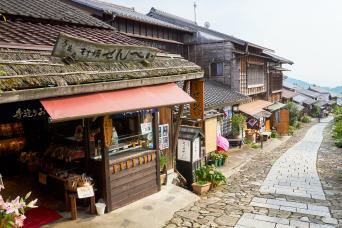 A train journey followed by a 10-minute bus ride will take you to the small town of Tsumago. Another of the post-towns on the Nakasendo Trail, Tsumago has been preserved by strict self-imposed rules that prohibit the sale, rental or destruction of the handsome houses. It’s a living museum, but one which is still inhabited by the local residents. You can wander the streets, tasting gohei-mochi, skewered balls of pounded sticky rice covered in a sweet paste of miso, sesame and walnuts. There will be time to visit the folk museum, with exhibits on the old Nakasendo Trail and the village. From here, the trail winds its way over the Magome Pass for just over 8 kilometres / 5 miles to the neighbouring town of Magome. You will have the opportunity to walk this lovely section of the trail through forest and countryside, past farms, rice fields, traditional houses and pretty gardens. Local bus provides an alternative. We will arrive in time to check in to our minshuku, a lovely family-run inn. After breakfast, you travel to Takayama. Takayama was formally an enclave for skilled carpenters working for the imperial courts in Kyoto and Nara. It has retained much of its traditional architecture and is well-known for its crafts, particularly yew-wood carving, Shunkei lacquerware, pottery and furniture. 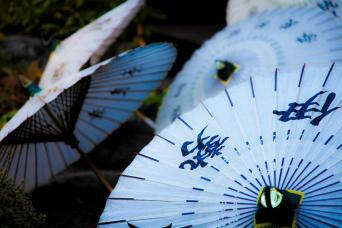 After arriving at your ryokan, there may be time to explore the surrounding areas. Relax in a hot-spring bath before dinner. In the evening you can try the local Hida beef and perhaps some locally-brewed saké. Today you have a full day at leisure in Takayama. 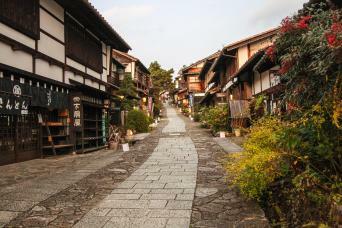 You can explore the San-machi area with its rows of old merchant houses, some open as museums. You might visit the morning market. In the afternoon, wander the old town and hunt for souvenirs or perhaps see some of the museums, such as the Takayama Matsuri Yatai Kaikan (Takayama Festival Floats Exhibition Hall), which displays some of the huge, elaborate floats used for the Takayama Festival, famous as one of the three most beautiful festivals of Japan. Admission also allows entrance to Sakurayama Nikko Kan, which houses a scale model of the Toshogu Shrine in Nikko, built over a period of 15 years almost a century ago. In the morning, you can visit Takayama Jinya, a local governor’s office during the Edo period. There once were more than 60 similar buildings in Japan, however Takayama Jinya is the only one left today. After lunch, you travel by bus to Shirakawa-go, north-west of Takayama in the Sho-kawa valley. The village of Ogimachi in Shirakawa-go is home to a large number of gassho-zukuri houses, and has been a UNESCO World Heritage site since 1995. These large wooden houses have steep thatched roofs designed to withstand heavy snow, and the term gassho-zukuri refers to the shape of praying hands formed by the roofs. Inside, the houses could accommodate large extended families of up to sixty people. You leave the mountains today, travelling by bus to Kanazawa. Kanazawa is famous for its crafts, folk art and rich history, as well as being the location of one of the most famous gardens in the whole of Japan. Take a leisurely walk to the Kanazawa Castle, once home to the clan of the feudal Lord Maeda or take a leisurely stroll through the world-renowned Kenrokuen Garden. Continue onwards by train to Osaka, then travel along the scenic Nankai Railway Line to Mount Koya, a bowl-shaped valley filled with stands of cedar trees high in the mountains of the Kii Peninsula. Since the 9th century, when the priest Kukai (also known as Kobo Daishi) founded the first temple and the shingon sect of Buddhism, Mount Koya has been a place of religious devotion and ceremony. Today there are more than 100 monasteries, many of which have shukubo (temple lodgings). You will stay in one of the elegant temples, run by the monks, and dine on shojin-ryori (Buddhist vegetarian cuisine). You can take a walk through the vast Okuno-in cemetery, with thousands of graves and memorials to feudal lords and other past luminaries. Leaving the mountains behind, you travel by train to Kyoto and check in to your accommodation, a comfortable modern hotel in the centre of the city. You can also opt for the informal, Japanese-style Yoshimizu Ryokan where you will sleep on futons in tatami-mat rooms; as with the Japanese inns you will experience in the more rural areas of the trip, bathroom facilities are not attached to your room but ‘along the hallway’. In the evening you can take a walk through the Gion district famous for its many ryotei (exclusive private restaurants) and the geiko (full-fledged geisha) or maiko (apprentice geisha). You can also visit the Sanjo-ohashi Bridge, the western end of the Nakasendo Trail. A day to explore Kyoto with your own personal guide. One of our knowledgeable, friendly and professional guides will meet you at your hotel after breakfast and lead you on a full-day tour of Kyoto. You can opt to travel by bus and subway, or by taxi – you pay for travel and entry fees on the spot. We have devised five different itineraries for you to choose from; we have included some of the most famous sights and some lesser-known spots. We are proud of our guides – we engage them directly and not via agencies or other third parties. Your guide will return you to your hotel around 5pm or, if you prefer, will leave you in an alternative location of your choosing. The ancient city of Nara, which preceded Kyoto as Japan’s capital from 710 to 784, is one hour south of Kyoto by train. You can visit Todai-ji temple, with its bronze statue of Buddha. The temple is said to be the largest wooden structure in the world. Afterwards, we suggest a visit to the old merchant district of Nara-machi with its narrow streets, shops, cafes and restaurants, or instead a walk along the back road from Todai-ji to Kasuga Taisha Shrine. You return to Kyoto by train at the end of the day. Your Oku Japan tour ends this morning after breakfast at your tour hotel in Kyoto. Fly out from nearby Osaka Kansai Airport, or extend your trip with one of our tour extensions.